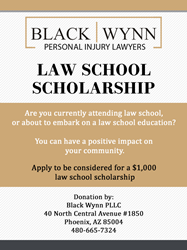 The personal injury law firm of Black Wynn PLLC, located in Phoenix, Arizona, is offering a scholarship for law students and prospective law students. It is a $1,000 scholarship that will be used to offset tuition at the law school which the winning applicant attends (or will attend). Obtaining a law degree is expensive and takes a significant amount of time and effort. The partners and staff of the firm are hopeful that the scholarship will ease to some degree the economic burden associated with obtaining a law degree. Black Wynn PLLC, a personal injury law firm located in Phoenix, Arizona, is offering a scholarship for law students and prospective law students. The scholarship, which is in the amount of $1,000, will be used to offset tuition at the law school which the winning applicant attends (or will attend). Partners David A. Black and William H. Wynn understand that a law school degree confers numerous benefits on graduates. They also believe, however, that those benefits are accompanied by certain responsibilities to others, including the community in which they live and practice law. Obtaining a law degree is expensive and takes a significant amount of time and effort. The partners and staff of the firm are hopeful that the scholarship will ease to some degree the economic burden associated with obtaining a law degree. The award will be in the form of a direct tuition payment to the law school chosen by the scholarship winner. Eligible applicants include U.S. citizens who currently attend, or who expect to be attending in the near future, a United States law school that is accredited by the ABA. Interested parties are urged to visit the firm’s website. There you will find details concerning the scholarship process and the online application. The application deadline is February 12, 2020, and name of the winning applicant will be announced by June 24, 2020.